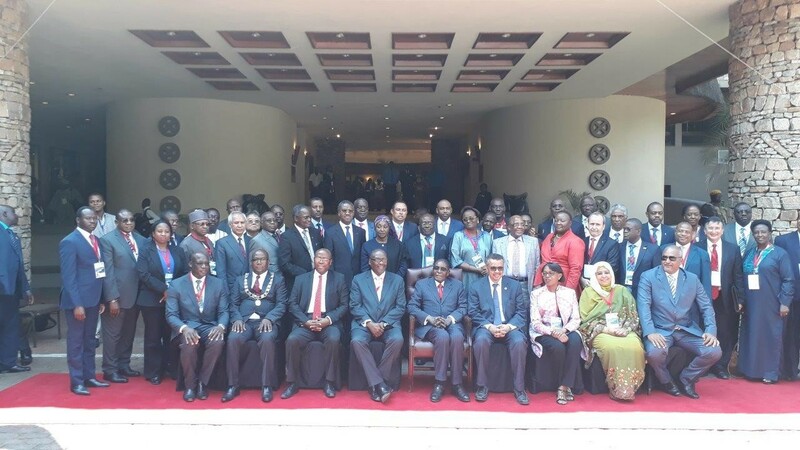 Dr. Ali Elbireer, CEO of the African Society for Laboratory Medicine (ASLM) recently attended the 67th session of the World Health Organization’s (WHO) Regional Committee for Africa. The session took place from 28 August to 1 September 2017 at the Elephant Hills Hotel in Victoria Falls, Republic of Zimbabwe. This annual session brings together the Ministers of Health from each of the 47 Member States in the WHO African Region. ASLM was invited to participate as an observer. The President of Zimbabwe, H.E. Robert Mugabe, has called on African governments to prioritize health in their national development agendas. He has stated that concerted efforts are required to tackle the health challenges facing the Region, including communicable diseases, maternal and child deaths and non-communicable diseases. During the meeting, the WHO Regional Director for Africa, Dr. Matshidiso Moeti, presented a report on the work of the WHO in the Region for 2016 to 2017. This was followed by a draft concept note on the WHO Thirteenth General Programme of Work. The delegates reviewed the five-year draft global strategic plan to improve public health preparedness and response, which was followed by a report on the implementation of the Transformation Agenda. During the session, delegates raised prominent topics including the framework for health systems development for universal health coverage in the context of the sustainable development goals in African region and reducing health inequities through addressing social determinants of health. Finally, the delegates discussed the Regional Orientation for the implementation of the Programme Budget 2018-2019. There were several side events, presentations, technical briefings and an exhibition on WHO’s work in the African Region. “Since one of ASLM’s priority areas is advocating for the quality of laboratory medicine on the continent, the WHO Regional Committee for Africa provided an ideal platform for practice and constructive dialogue on these matters,” said Dr. Elbireer.